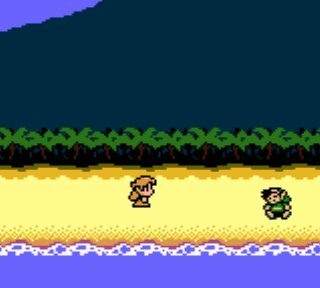 Link's Awakening DX is a new version of the game released for the Game Boy Color. This colourized version includes a few bonuses: an additional dungeon, photographs and the content of the chests is sometimes different. The original version was out in 1993, the DX one in 1998. Though you fufilled the Hyrulian prophecy of the Legendary Hero and destroyed the evil tyrant Ganon, the land of Hyrule enjoyed only a precarious peace. "Who knows what threats may arise from Ganon's ashes?" the restless people murmured as they knitted their brows and shook their heads. Ever vigilant, you decided to journey away from Hyrule on a quest for enlightenment, in search of wisdom that would make you better able to withstand the next threat to your homeland. Months of difficult travel passed. After a long and fruitful voyage, you breathed deeply the sea spray from the deck of the ship that carried you home to Hyrule. But your homecoming was not to be. 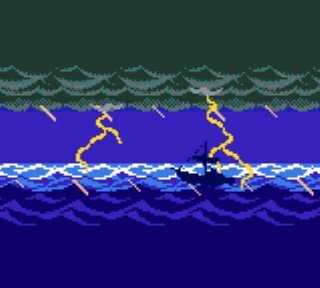 Suddenly a squall struck your ship, and though you valiantly fought the waves, a lightning bolt reduced your ship to splinters. Your world faded to black as you sink into the darkness of the storm-tossed sea with the remains of your craft. But in the cold darkness of the deep, you heard a comforting voice that reminded you of home. It was the voice of Princess Zelda! "You're going to be all right!" the voice said. "What a relief!" You opened your eyes to find Princess Zelda standing over you - or was it?! Actually, it turned out to be a woman named Marin. She explained that you had drifted with the wreckage of your ship to the shores of Koholint Island. This mysterious island was unique for the gigantic egg which crowned its centeral mountain. It was said that a mythical creature, the Wind Fish, lay asleep inside the egg. "Awaken the Wind Fish and all will be answered." "What is the Wind Fish?" you wonder... And what did its awakening portend? Your most mysterious adventure yet, following the riddle of the Wind Fish throught the uncharted island of Koholint, is about to unfold. The Legend of Zelda: Link's Awakening DX is not just colourized! There are new mysteries and events to make your adventure more exciting! If you are using the Game Boy Color, a brand new dungeon awaits you with new monsters, a new boss and even new helpful items hidden deep within the dungeon. There is also a camera store and photographer somewhere on Koholint Island. You can take pictures and print them using the Game Boy Printer (sold seperately).